If you are planning a visit to Bend and want the freedom of having your own space, don’t sweat. There are plenty of vacation rentals in town. 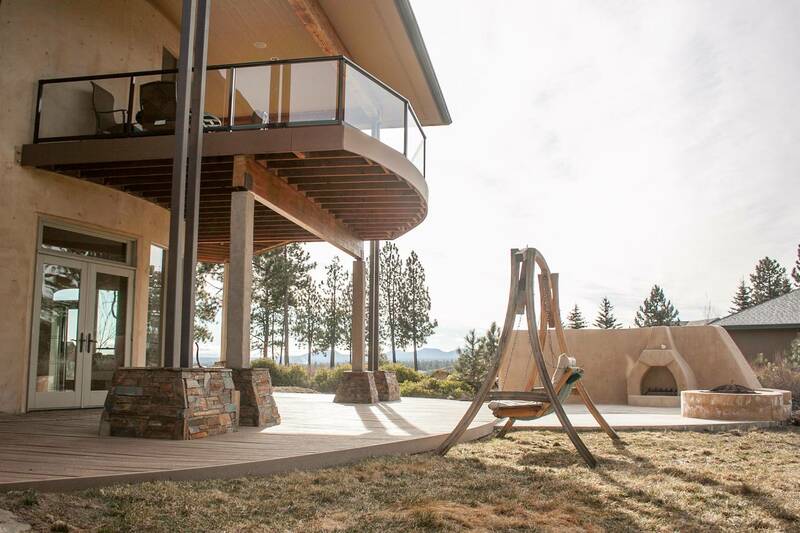 We’ve curated this list of some of the best Airbnb’s in Bend. With so many great Airbnb options, you’re sure to find the right one that fits your needs. So, go ahead and book the perfect Airbnb in the center of it all in downtown Bend, or just pedal strokes away from Phil’s Trail complex, or stay minutes away from making turns on Mt Bachelor. 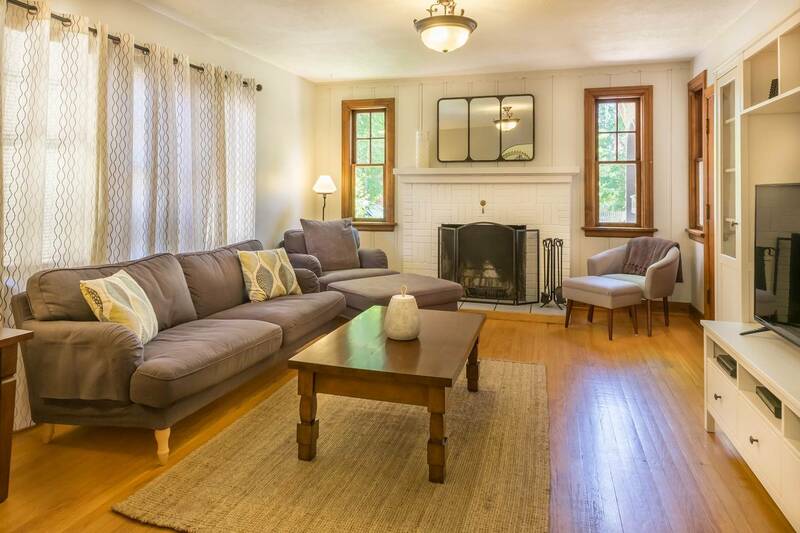 This stunning historic 3-bedroom house is just steps away from downtown Bend. As you are located in one of Bend’s oldest and most central neighborhoods. Everything is walkable from this Airbnb. You can buy groceries just around the corner at the New Market of Choice or grab a coffee or delicious meal at Jackson’s Corner. Use this as a base camp for exploring downtown Bend, Oregon or enjoying Central Oregon’s endless outdoors. 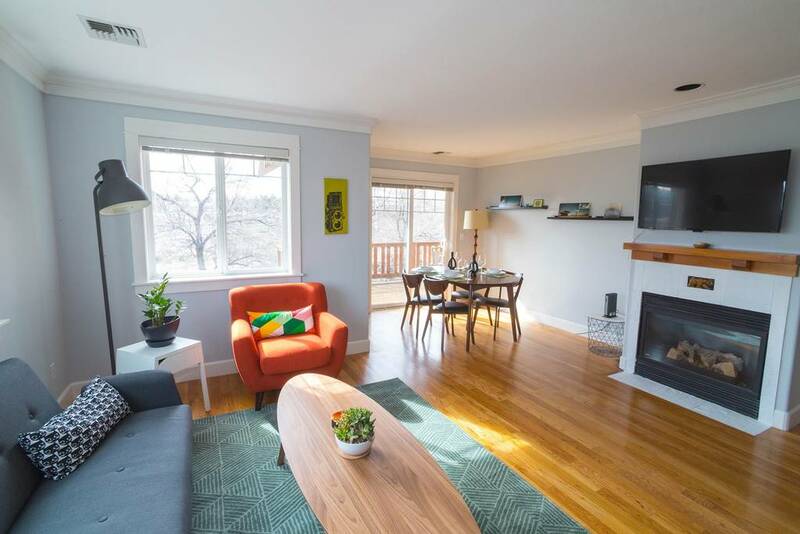 This three-bedroom, two-bathroom house features two bedrooms and a full bath on the main floor, as well as an airy master suite with full bathroom on the second floor. For storage of your outdoor gear, you have full access to the garage. The house is also pet-friendly and has a wonderful enclosed backyard to let Fido play while you grill on the back deck. 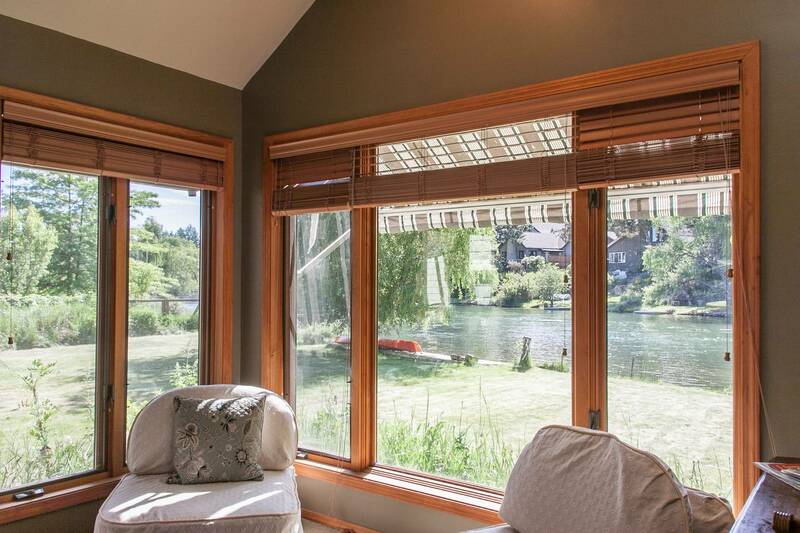 With waterfront views of Mirror Pond and Drake Park, this well-appointed house is a 5-minute walk from downtown Bend. Forget about driving during your stay as you can easily walk to restaurants, bars, shopping, or along the Deschutes River Trail. With 3 bedrooms, 2.5 bath, and a spacious living area and kitchen, this Airbnb comfortably sleeps 8 guests. The house is divided into two separate wings if privacy is an important factor. 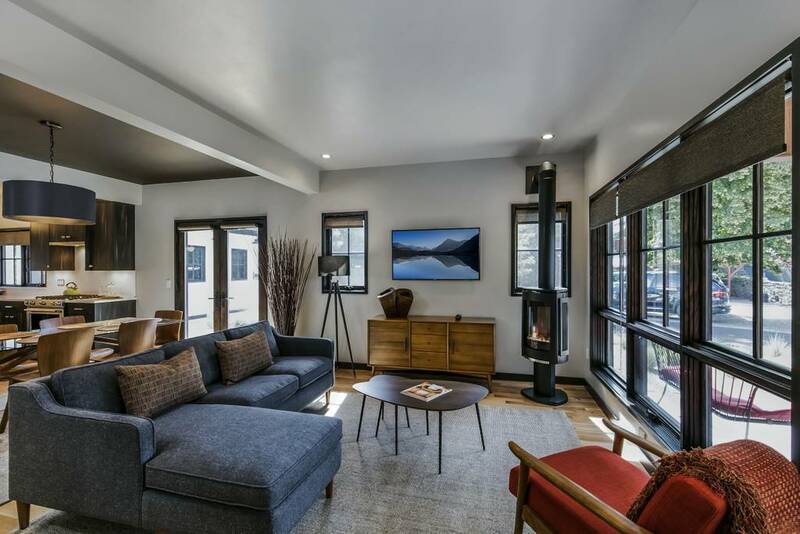 Whether you want a centrally located Airbnb in downtown Bend, or a relaxing retreat for exploring all that Central Oregon has to offer, this is house has it all. After cooking up a meal on the professional range in the kitchen, you can enjoy it either inside or on the outside patio with river views. 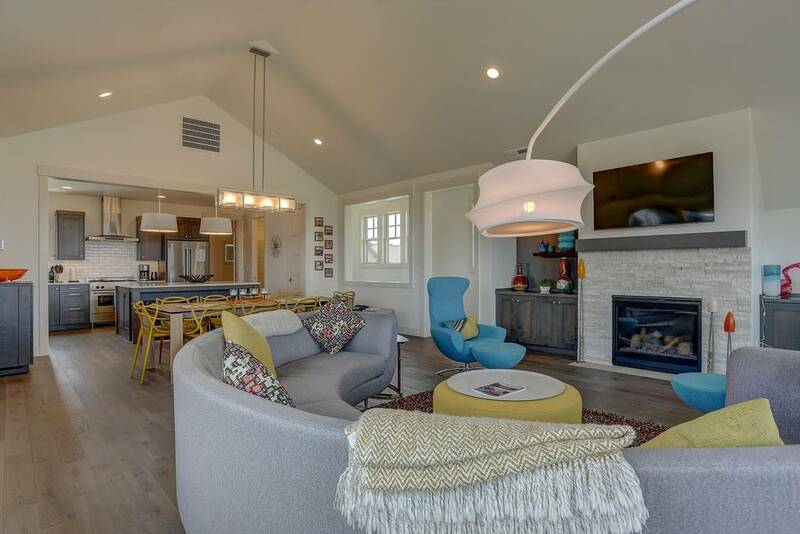 A highlight of this house is that you can launch directly into the river from the backyard with paddle boards or tubes that are provided at the house from May to October. 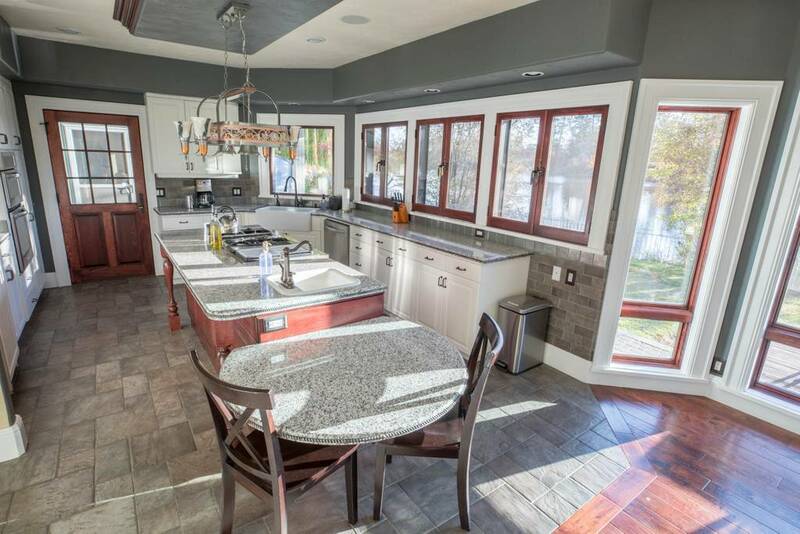 This house is the perfect central location if you want to see and do a little of everything during your stay in Bend. 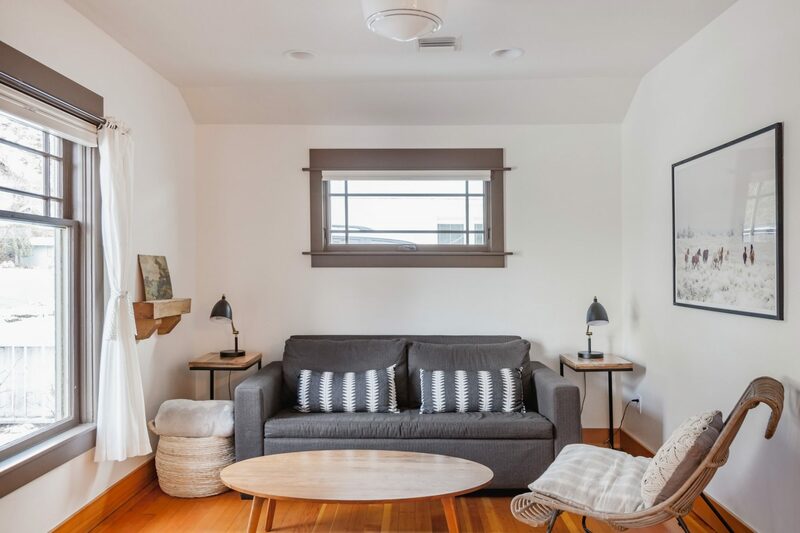 Located next door to the Deschutes River, this downtown Bend Airbnb is within a short distance from restaurants, parks nightlife, and family-friendly activities. With two bedroom suites, both with attached full baths, this house is perfect for a family of four or even for two couples on a getaway together. One of the bedrooms even has a crib included for the littlest member of your family. The full spacious kitchen and mid-century inspired ambiance make it tempting to skip the night out, opting for a quiet night in snuggled up with a nice meal and a cup of cocoa. However, if you do muster up the nerve to leave, you can easily take a short drive to the ski slopes or take a short walk to grab some delicious local eats. What’s better than a romantic couple’s getaway or honeymoon in a cozy cottage? What if that cottage wasn’t so remote and was in fact right in the heart of downtown Bend? That’s what you will find here at Little Lava Cottage. 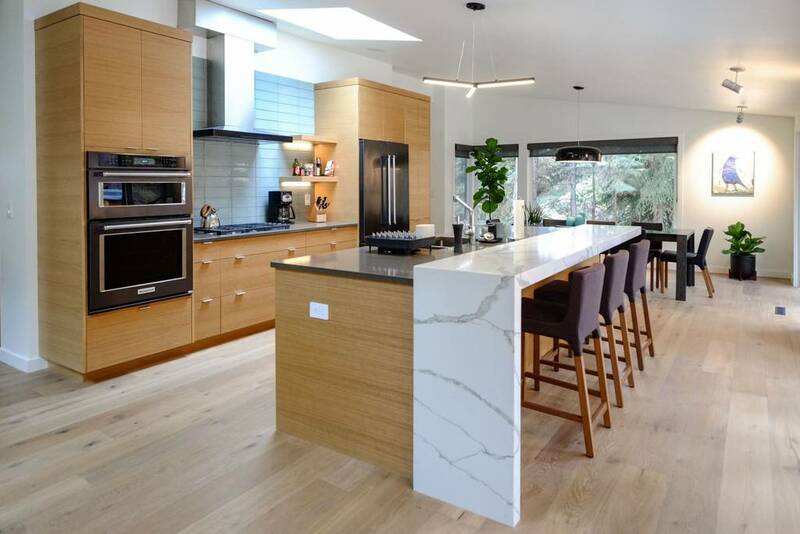 Don’t let the fact that it was built in 1930 fool you; the entire place has been rejuvenated with bamboo flooring, concrete counters, and 21st century appliances and décor. From the king size bed with luxurious sheets and duvet to the fully stocked kitchen, you will find everything you need for a comfortable getaway. With your rental, you have access to the entire space. This includes the bike shed which can be used to store your winter gear and 2 cruiser bikes for you to enjoy during your stay. The cottage is even pet-friendly with an enclosed yard for your pooch. What more could you ask for? 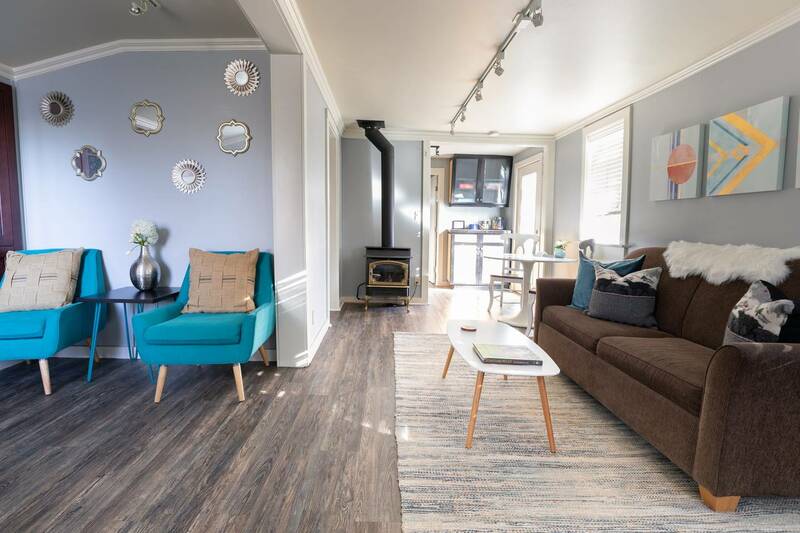 This Airbnb located in downtown Bend is perfect for a family vacation with the kiddos and even the four-legged children. Located right off Portland Avenue, you will people watch right off the front porch or even take a stroll or bike ride downtown. There are technically three bedrooms, with the first two offering comfy beds with high quality linens. However, the third bedroom is more suitable for children as there is only a small click futon. If you plan to use this room, be sure to bring your own sleeping bags or blankets; pillows are provided though. If the futon is not quite to your liking, you can opt for the pull-out sofa in the living space. It has a queen size, memory foam topped mattress complete with bed linens. The best part about this rental is the backyard. It is fully enclosed to allow your pups to run freely. The back patio also includes a hot tub, ideal for a hot soak after a day in the mountains, and a grill for smoky, outdoor cooking. 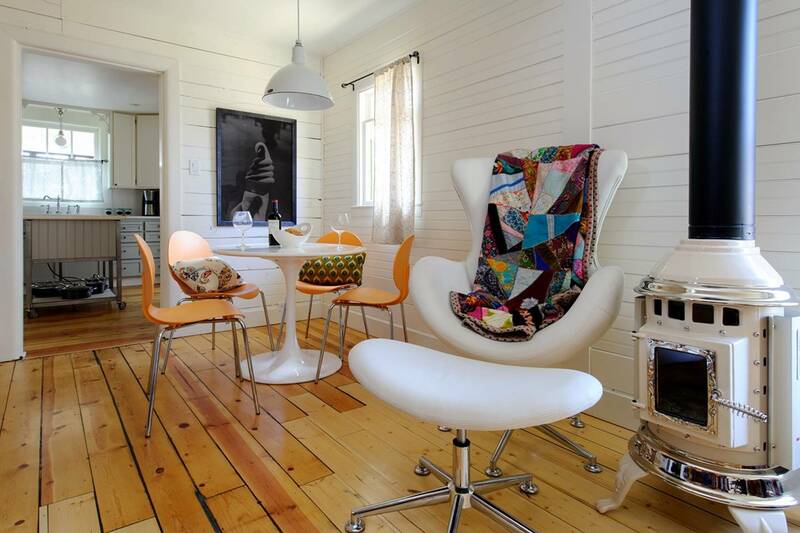 Still within walking distance from downtown, this house is a cute and fun place to stay for small groups or families. This one-bedroom historic cottage is located above Lava Flo, giving you a great view of downtown from the large outdoor deck. There may only be one bedroom, but there is actually enough space and bedding for up to 4 or 5 people. In the main bedroom, you will find a comfy queen size bed and high windows providing gorgeous natural light. Within the house, you will also find a twin bed tucked into an alcove – a fun, cozy space to sleep with curtains for privacy – and a pull-out sofa in the living room. This house is also a pet-friendly Bend Airbnb. Here you can enjoy a small, covered and fenced yard off the deck and a small fenced front yard as well. With quick access to great parks and trails, you will be able to take your four-legged friend out to play and exercise with no trouble. Just a couple of blocks outside of downtown Bend, you will find this historic home both beautiful and cozy as well as pet-friendly. The entire house has a light and airy feel; white walls with wooden trim give it a cottage-y feel while the décor and cool color scheme helps it to feel modern. The kitchen is fully equipped with gas range and stainless appliances. You can either choose to eat inside at the breakfast nook or countertop with bar stools, or you can cook outside on the back patio with the grill. You will also find a cozy hot tub to take a dip in after a day out in the cold. With your A-plus rental, you will find that there isn’t much you need to bring with you. Washer and dryer are provided as well as pillows, sheets and blankets, towels, shampoo and soap. There is also wi-fi, TV, and free parking on premises. Everything about this little cottage will feel like a home away from home. 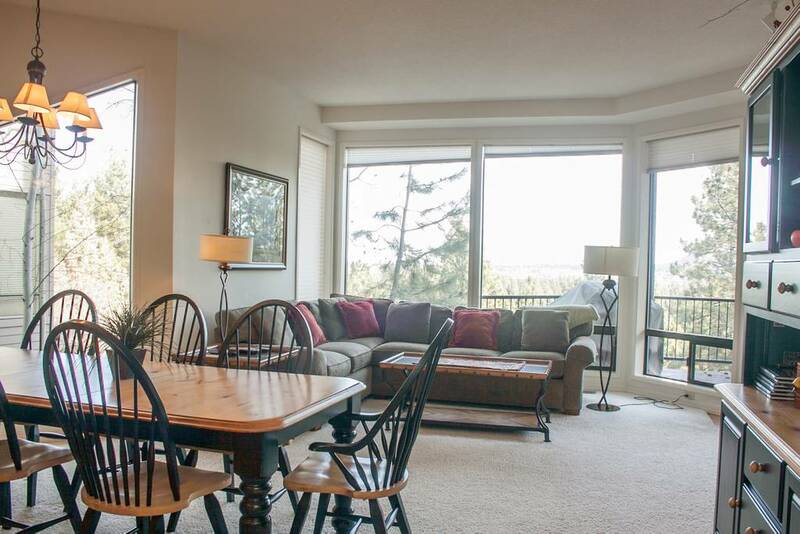 Able to sleep up to 6 guests in addition to being a pet-friendly Airbnb in Bend, this location is the perfect spot for a family vacation the mountains. There are technically four beds – a queen bed in the master bedroom, two single beds in the second bedroom, and a pull-put sofa in the living space – so there is plenty of space for you and the kids to spread out and relax. Located near the river and a hop-skip-jump from the ski bus, there are plenty of activities to immerse yourself in during your stay. Take a walk down the trail with your pooch to McKay Park, find a local joint to stop in for a brew or cup of coffee, or just stay in and let your pup run around the fenced yard while you soak in the hot tub or warm yourself at the fire pit. The house itself is beautiful inside, with high ceilings, an open floor plan, and large windows to let in plenty of sunshine and give the entire space a light and airy feel. With a fully equipped gourmet kitchen, 3 large HDTV’s, an outdoor patio with gas grill, and load of indoor and outdoor games, books, and toys, you will never want to leave. However, you are in Bend, so chances are you will want to try some of the local flavor. No worries here. Simply walk to the Bend Ale Trail or use one of the provided cruiser bikes to venture into downtown and find a bite or cup of coffee. This gorgeous large house is a great place to host a family reunion or simply to celebrate a special occasion with a getaway with friends. The luxurious, modern furnishings and natural surrounding are sure to win you over and leave you wanting to come back again. Centrally located 10 minutes from downtown Bend and 20 minutes from Mt. Bachelor Resort, you have easy access to local entertainment if you choose to venture out of the house. All around the house, you will find yourself surrounded by nature with clear starry skies at night to enjoy by the fire pit on the patio. With 4 bedrooms and a common room with a pull-out sofa bed, this house can accommodate up to 13 people without feeling like you are cramped or stepping over each other. Whip up a meal in the full kitchen or take it to the patio for a cookout and a dip in the hot tub. 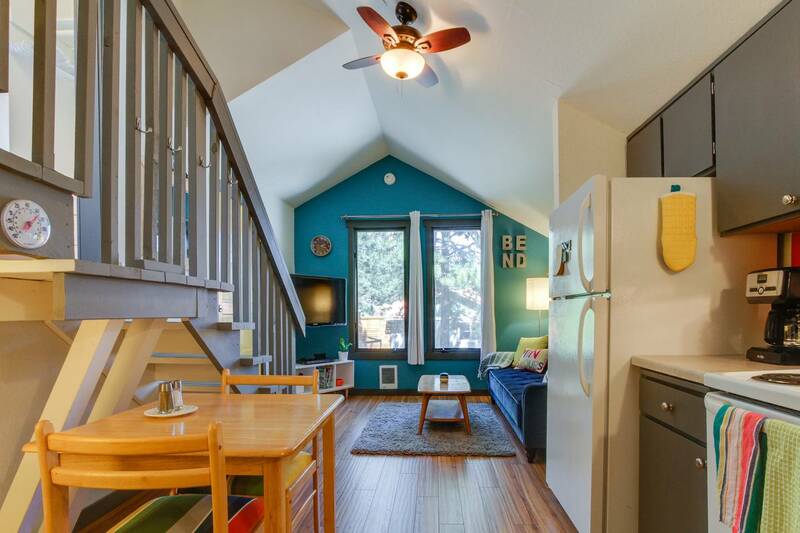 If you enjoy outdoor or mountain-related activities but camping isn’t really your thing, this large Airbnb house in Bend may be just what you are looking for. From the house, you have easy access to Phil’s trails for walking or biking as well as the road to Mt. Bachelor for skiing. This house is also very private, sitting on over an acre of land unoccupied by other homes. You can enjoy a nice evening outside with your large group of friends or play games on the lawn with your family. There is also very little you need to bring with you for your stay. With 6 bedrooms fully furnished and full linen sets in addition to all the towels, toilet paper, paper towels, soap, and shampoo you will need, all you need to bring is your clothes and food. Some vacation rentals just aren’t quite big enough for a family with more than 4 members. This house changes that. With 4 bedrooms and 4.5 baths, this house is able to accommodate up to 10 guests, making it the perfect Airbnb in Bend for a large family. Enjoy a night in with a meal cooked up in the fully equipped kitchen on the 6-burner gourmet chef’s stove. You will also find a table set for 8 as well as a counter with 3 bar stools for extra seating. Your kids with have an especially fun stay in the bunk room. There are two sets of bunk beds equipped with an extra trundle on each able to sleep up to 6 total in the room. It will feel like the best sleepover ever with toys, games, and their very own TV in the room. When venturing out onto the trails, there are 7 bikes available for you to use with your rental: 2 mountain bikes, 2 cruiser bikes, and 3 bikes for kids. You may not have chosen Bend for your vacation spot just to visit downtown for the shopping and local eats; you may have been looking for some adventure on the trails. 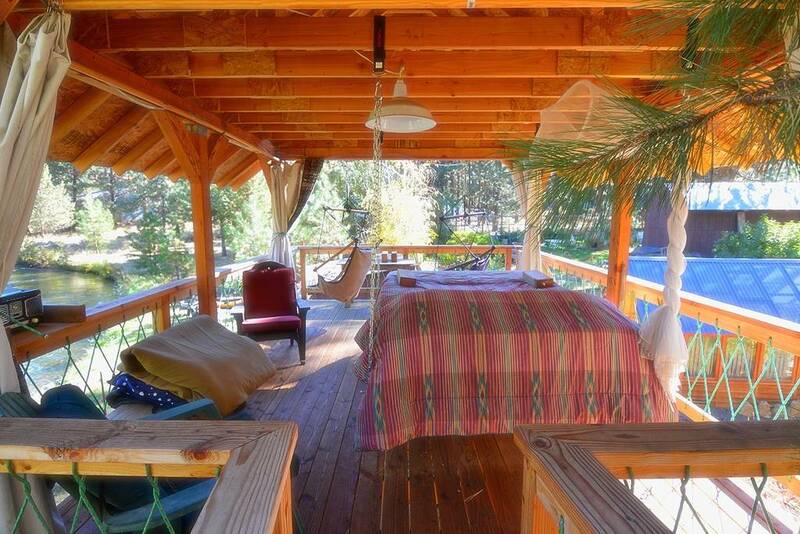 In that case, you want to find an Airbnb in Bend – like this one – close to the trails. This is a shared house. With your rental, you will have the entire first floor to yourself, complete with 2 bedrooms, private bathroom, sun room, great room with pool table, and a large patio with a grill and fire pit. Nearby you will find outdoor activities in abundance. Mountain biking trails, white water rafting, and hiking trails to waterfalls and lakes to name a few. You can also find the Mill District nearby where you can grab something to eat or a cup of coffee when you aren’t too busy blazing the trails. Camping isn’t for everyone, but even if you don’t want to sleep outdoors it doesn’t mean you don’t want to spend a good amount of time in the great outdoors. 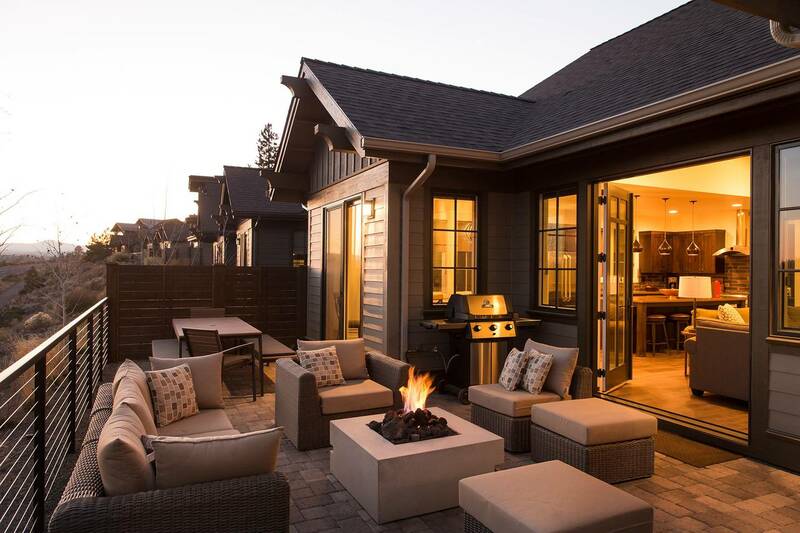 Here at this Tetherow home near the Bend, Oregon trails, you will find yourself enjoying a luxurious stay with all of your friends. This house is able to accommodate up to 16+ guests with 9 beds and 5 bathrooms. You will also find a well-stocked kitchen with all the cookware and dishes you need in addition to a large fridge, full size oven, and 6-burner stove. The patio is completely private and equipped with a BBQ and fire pit for a nice meal outdoors as well. From here, you have gorgeous mountain views with easy access to all of the Tetherow amenities. These include a swimming pool, recreation center, golf course, and complimentary shuttle to the Old Mill District and downtown Bend. 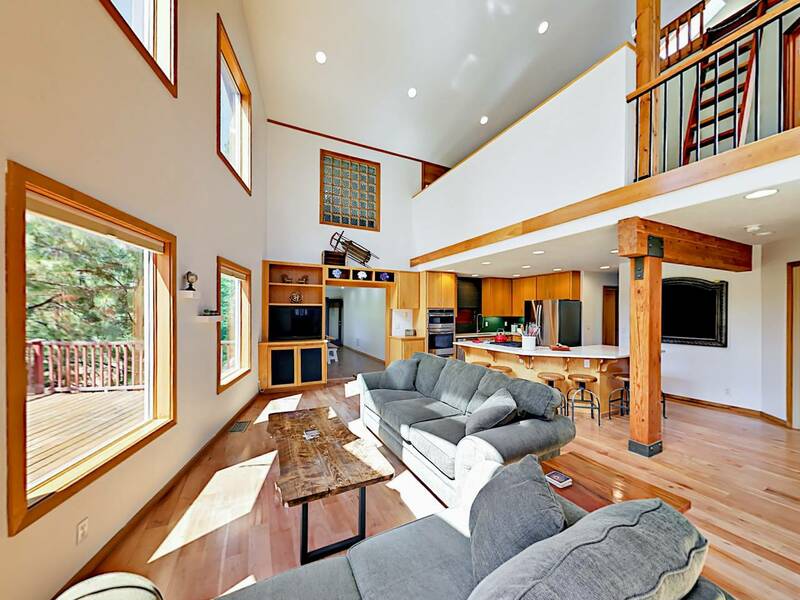 Even though this house is the ideal Airbnb in Bend for mountain biking, it may be hard for you to muster up the energy or desire to leave this luxurious home. With all the amenities available within the house itself, it’s easy to get caught up in vacation mode and find yourself lounging rather than exploring. Relax in the hot tub – which is nestled into natural rimrock – while taking in the gorgeous mountain views. Grab your favorite film and some popcorn to enjoy a movie in the home theater, complete with full wet bar. When you do finally feel like leaving the house, you can hop onto one of the provided bikes and head to the trails nearby. Ride up to Tumalo Falls or stop by the Newberry National Volcanic Monument. During the winter, you will also find yourself right around the corner from skiing on Mt. Bachelor or snowshoe adventures through Deschutes National Forest. For many, skiing is a must when visiting Bend, and this Airbnb is located surprisingly close to Mt. Bachelor (30-minute drive to the ski lifts). This location is great for small families who are looking for a mountain getaway during the winter. Your rental is technically two adjoining apartments, each with one bedroom and one bathroom. If you have older children, this can be a great way for all of you to get some private time and enjoy your own separate spaces while still enjoying your vacation together. 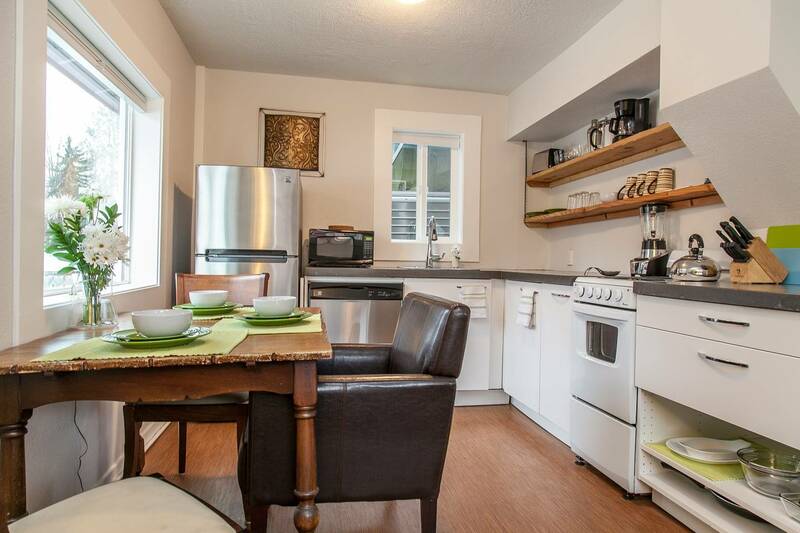 You also have a full kitchen with dishwasher as well as a living/dining area with fireplace to keep you cozy. The resort also has an outdoor pool and a few tennis courts if you decide to visit in the warmer months. From your apartment, you have excellent views overlooking the Old Mill District where you can find shopping and local eats. You are also within walking distance from the Deschutes River trails if you want to go out for a brisk hike. Everything about this cozy little apartment near Mt. Bachelor is adorable. From the unique layout and interior design to the fun, colorful décor, you are sure to leave with a few new ideas for your own home. Perfect for a couple’s ski getaway, this apartment has one bedroom and bathroom and a compact kitchen and living room layout. With large windows and bedroom skylight, you get plenty of natural light in the space. You have quick and easy access to several Bend activities. Located on Century Drive, you are already on your way to Mt. Bachelor. You are also only 1.5 miles from Phil’s Trail and have easy access to the Old Mill. Don’t let its small size deter you from booking; you still have plenty of space to store your outdoor gear. The landing on the way up to the apartment has ample space for kayaks, bikes, or ski storage. Another great Bend Airbnb close to Mt. 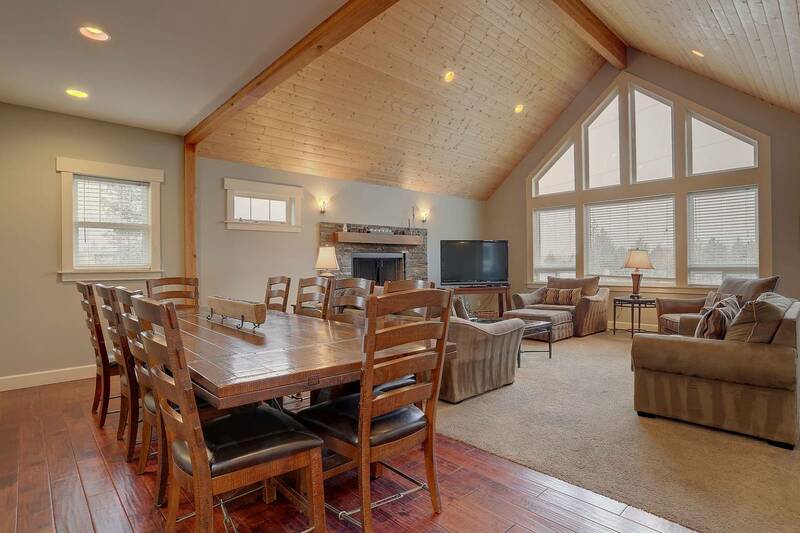 bachelor, this home is ideal for large families or groups who wish to enjoy some time on the slopes. You know you are close to all the skiing and snowshoeing you could want since most of the rooms face the Cascade mountains, with views of Three Sisters, Broken Top, and Mt. Bachelor. This house also borders the Deschutes National Forest, which puts you only a few steps away from some of the best hiking and mountain biking trails. The interior of this house feels huge with its vaulted ceilings, large living room, dining room, kitchen, and 5 bedrooms. The dining table even has enough room to seat 12 comfortably. Included with your rental, you will also have access to the hot tub on the paved stone deck, TV with cable, high-speed wi-fi, and two-car garage. Skiing and mountain biking may not be your things; you may just enjoy a leisurely walk through the mountain trails or taking in the natural views from the comfort of the great indoors. 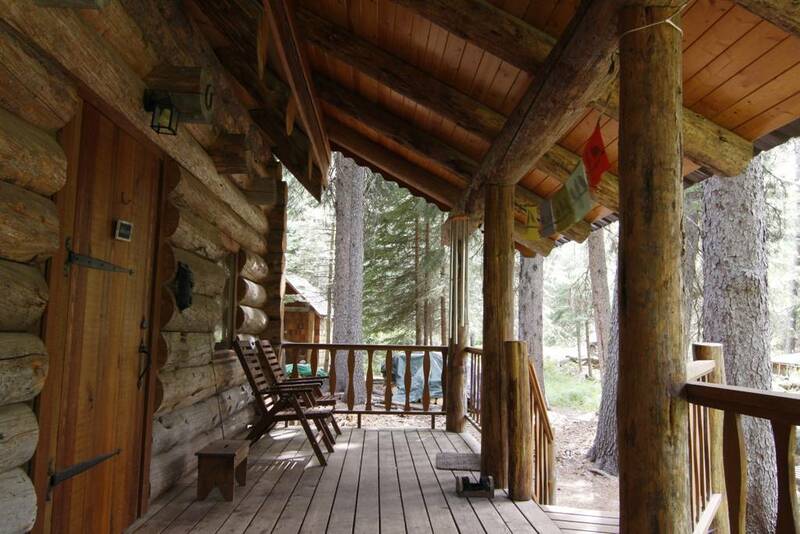 Well, this log cabin is the perfect Airbnb in Bend surrounded by nature. Located near Tumalo Falls, you will find yourself surrounded by towering pine trees while you listen to the rushing water of the falls and creek. 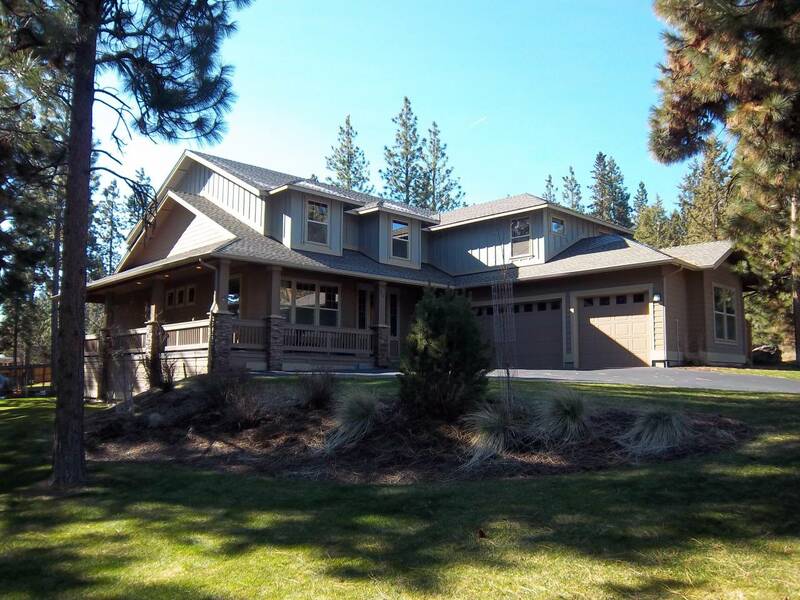 It is a nice, private location nestled on 1.5 acres while still only 9 miles away from downtown Bend. Ideally, this rental is ideal for couples as it has s studio layout with only one bedroom and bathroom. It’s remote location and easy access to both the trails and downtown make it a great choice for a romantic getaway or honeymoon. Another great Airbnb in Bend near nature is this large home, ideal for big families or get togethers. You can even bring your four-legged canine friends for an additional fee. This house offers a bit of everything, starting with its prime location. 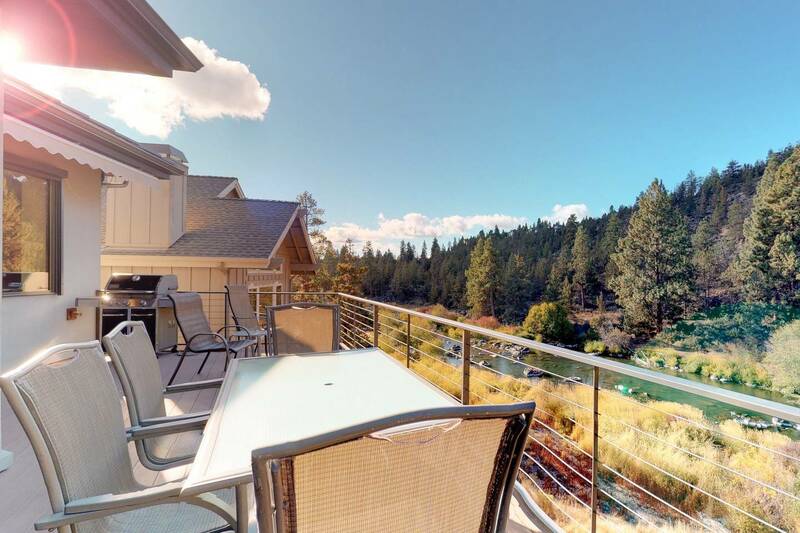 It is only a short distance from downtown Bend – where you can find all of the shopping and dining you could ask for – as well as Sawyer Park, where you can easily access a variety of hiking and biking trails. If Mt. Bachelor is what you are after, whether you have summer or winter activities on the docket, you are less than a 30-mile drive away. Within the house itself, you will find a home theater, game room with pool table and a couple of arcade games, full kitchen with island seating, 5 bedrooms, and a hot tub on the back porch with a view of the Descutes River. As a kid, movies like Tarzan and The Swiss Family Robinson always intrigued me for one reason: I thought it would be awesome to live in a treehouse. Well, for those who feel the same way I do, you’re in luck. Here you will find an actual Airbnb treehouse in Bend. Due to its unique layout – it’s in an actual tree – this rental is for adults only. However, there is space for 4 people, so you can play for a double date, couples’ getaway. You will truly find unique and rustic living here. The rental is only available for the summer from May 1 to October 1. There is electricity to power the lights, but you will find that it is mostly open-air, outdoor living, similar to camping but with a comfy bed. Under the treehouse you will find your bathroom and kitchen. You have hot water for the shower, but the toilet is a composting toilet. The kitchen/cooking area has a propane stove over a dirt floor. It’s roughing it in the best way. Looking for something cheap, small, and simple? Stay in a van! No, really. 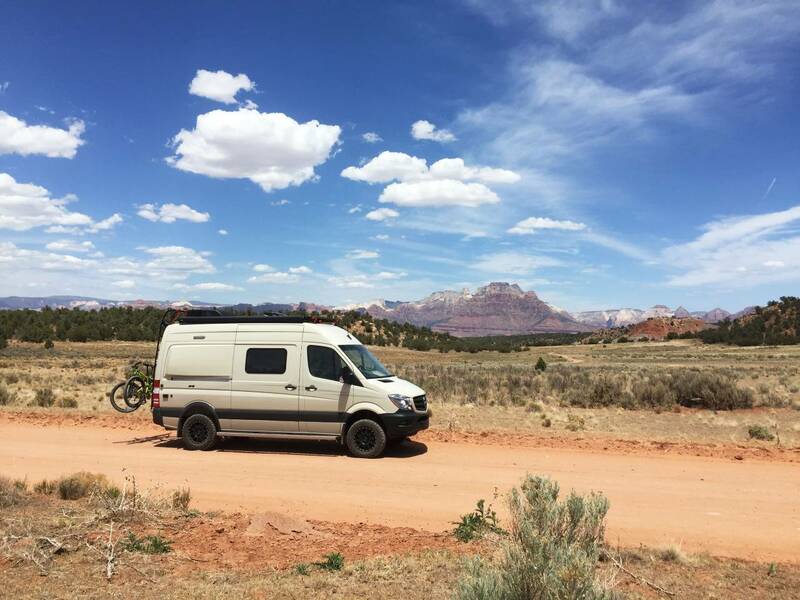 This is a camper van Airbnb in Bend, ideal for the couple who doesn’t want to spend a lot of time indoors, opting for a more adventurous vacation. The Tan Van is available during all 4 seasons; it stays very warm in the winter months. Inside you will find diesel heater, full shower and bathroom, comfy double bed, and full kitchen with induction stove and sink. You cannot drive the van anywhere, but it parked in a prime location within walking distance from downtown Bend, Drake Park, the Deschutes River, and various local eateries and breweries. Whether you are looking for outdoor adventure or cultural exploration, this may be the right place for you. 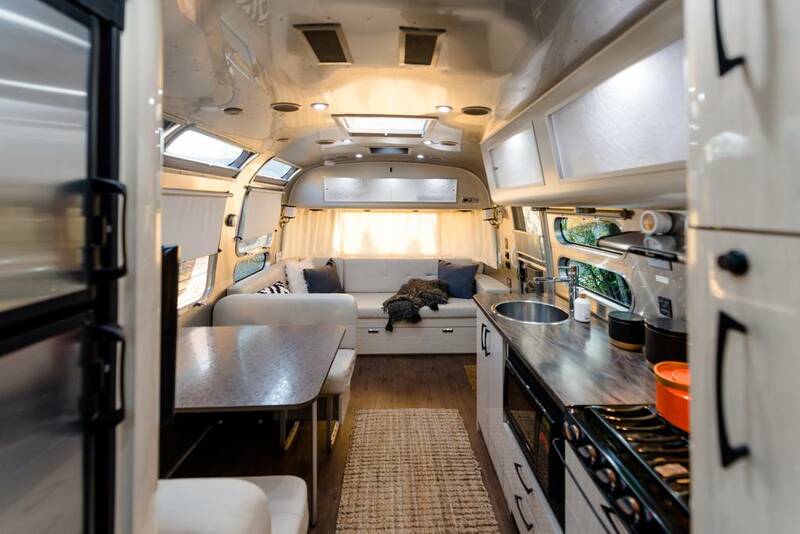 Another unique Airbnb in Bend, this Airstream camper is a great place to book for your small family or simply for a couple looking for somewhere simple to stay while exploring all that Bend has to offer. The Airstream sits on Redmond’s dry canyon where you have easy access to canyon trails for walking and biking. Since the camper is located next to the owner’s home, you can also enjoy morning coffee in the courtyard right off the back of the trailer. Upon arrival, the owners will take you through a quick walk-through to explain some of the items exclusive to Airstream, including heating, cooling, and the water pump. Afterwards, you can get right into enjoying your unique vacation rental. 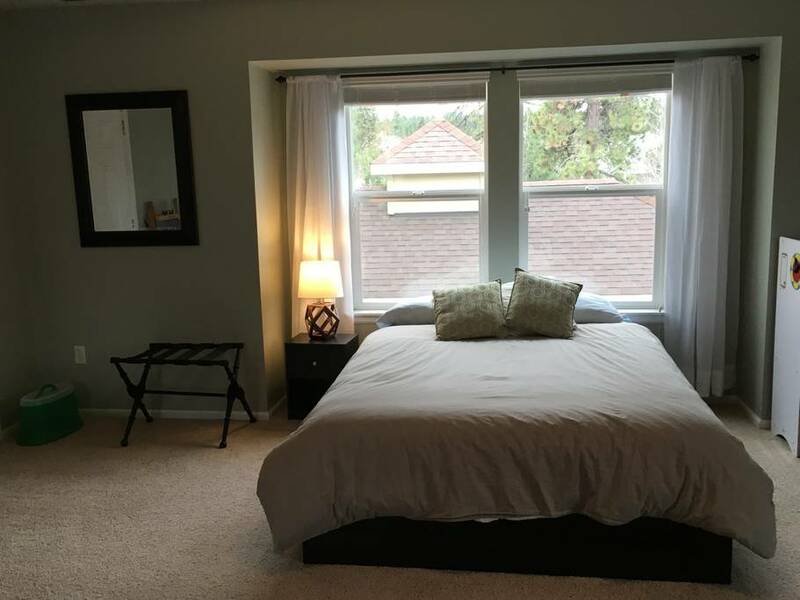 Not only is this Airbnb in Bend under $100 per night but it is also in a prime location that allows you to walk everywhere you may want to visit in either downtown or the Old Mill District. You are also close to the Les Schwab Amphitheater and Deschutes River for some outdoor fun as well. The house accommodates 4 comfortably with 2 beds and one bathroom. The first bed is located in the only bedroom while the second is a sofa bed in the main living space. 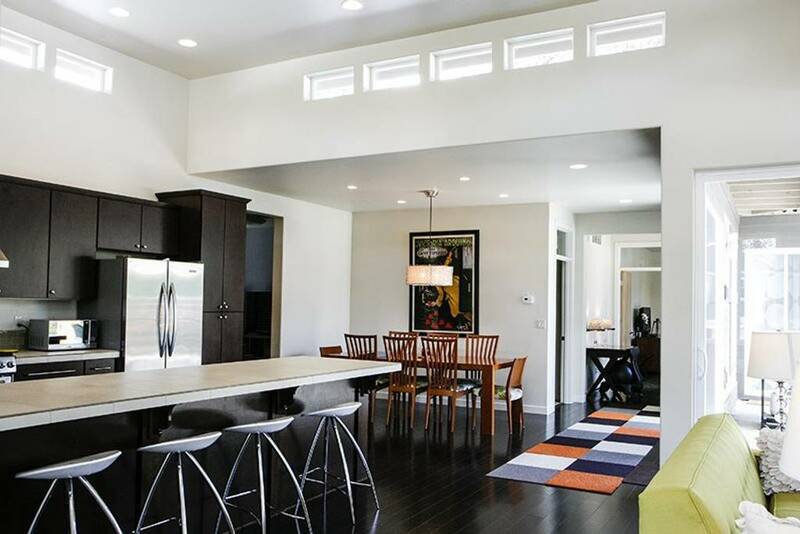 You will also find a small, modern kitchen, indoor fireplace, and fun board games to enjoy with the kids. You have full access to the house, yard, and patio where you can soak up the sun in the warm summer months. Dogs are allowed as well, but be aware that the yard is not completely enclosed. 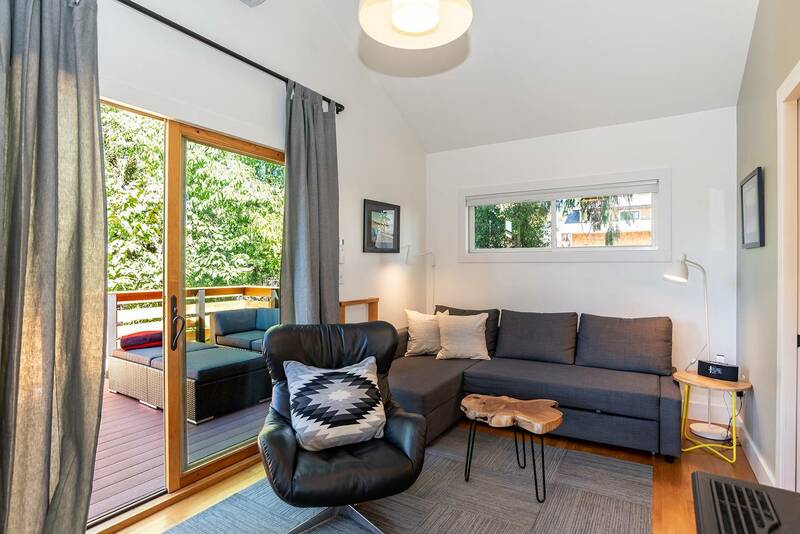 Perched two blocks from the Deschutes River, this budget Airbnb in Bend is the perfect home base from which to launch all of your outdoor adventures. Located in the Westside, you are within walking distance to restaurants and cafes in the Old Mill District. You also have easy access to the Mt. Bachelor shuttle which will take you to the ski slopes in the winter and the Les Schwab Amphitheater for additional outdoor entertainment. This is a second-floor unit with one bedroom and bathroom, fully equipped kitchen with stainless appliances, and a sofa bed in the living room for the kids or an extra guest. You also have access to high-speed wi-fi and a Smart TV with Netflix, Hulu, and PVS Kids. The garage is also available for gear storage with your paddle boards, kayaks, skis, and tubes. 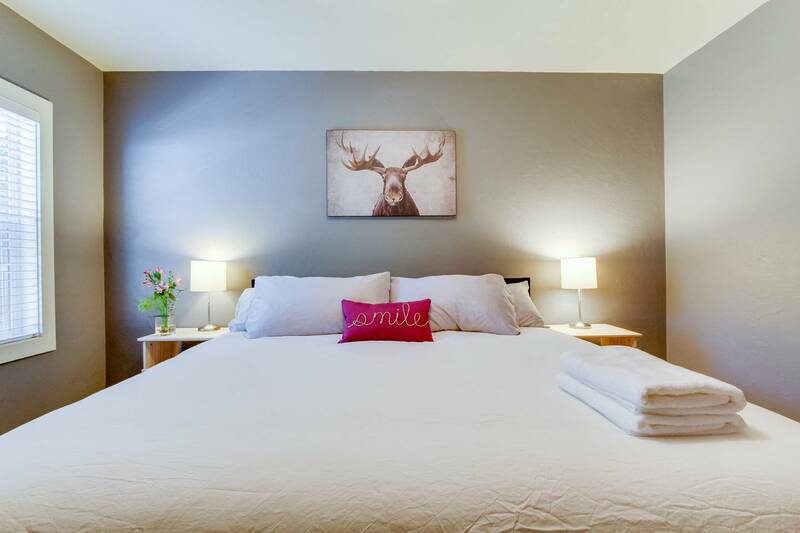 If you’re looking for the comforts of home but don’t need a full house to take care of on vacation, this cheap Airbnb in Bend offers a small guest suite that will have just what you need. The suite is a private space in a shared house, accessed by a private staircase in the shared garage. It includes a bedroom with its own attached bathroom. In your suite, you also have your own TV, access to wi-fi, a mini fridge, and coffee maker. Located across the street from a park in a quiet, friendly neighborhood, you can enjoy a nice place to sleep when you aren’t exploring all that downtown Bend has to offer. You are close to the Old Mill District, lakes, hiking and biking trails, and all the local food, coffee, and beer you could want. 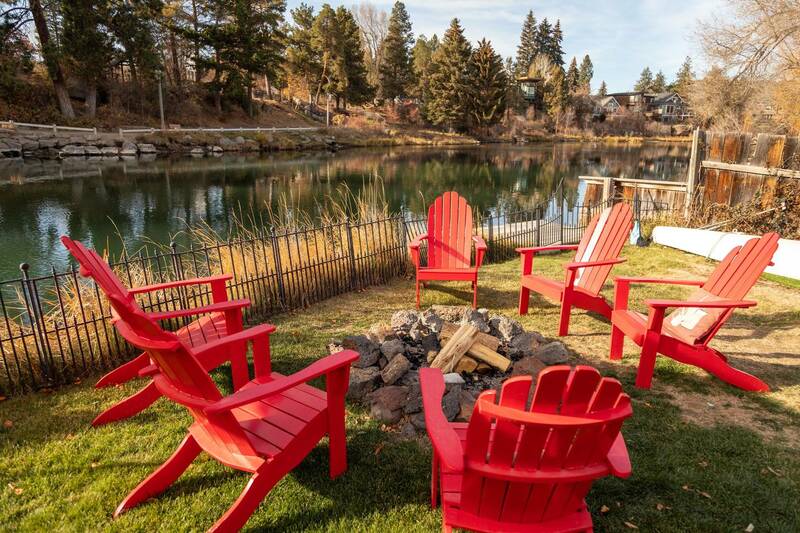 You can’t get much closer to outdoor river sports than an Airbnb in Bend on the river. With the Deschutes River right outside your door, you can go kayaking, rafting, or paddle boarding whenever you get the urge. There are even two kayaks available for you to set off right from the property. The rental is a studio suitable for 2 guests with one bedroom and one bathroom. There is also a small kitchenette that is perfect for fixing an easy meal at home. The yard is open and sunny, with an attached seating area right outside the French doors. The Trout house is also conveniently located half way between Old Mill and downtown Bend, so you don’t have to drive very long to find local entertainment, eats, coffee, bakeries and brews. This is another great location right on the riverfront in downtown Bend. You can easily float or paddle to Mirror Pond within 5 minutes, walk to downtown in 10 minutes, or walk to Old Mill in 20 minutes. No need for cars at this location. The Deschutes River is visible from almost every room in the 3-bedroom house. With 4 beds and 2.5 baths, this house is able to sleep up to 8 people, and up to 2 dogs are allowed for an extra fee. Everything is modern and first class; there are granite counters, hardwood floors, heated bathroom floors, and modern, new furnishings. You have access to the entire house, which includes quite a few amenities. There is a private kids’ loft with a large TV and game console. Outside, you have a sauna that fits up to four people and two paddleboards that can be launched right from the property. If you want to rent some tubes for the kids, it’s just a 5-minute walk away. On the river between downtown and the Old Mill District, this cottage is a great location to stay when you are in Bend, especially if you are looking to enjoy some time out on the river. Included with your rental are kayaks and paddle boards to save you some money on an extra rental. Upon your arrival, you will find welcome wine as well as wood and s’mores fixings to use outside at the fire pit. There are 2 bedrooms, 2 bathrooms, and a gourmet kitchen with everything you will need to be comfortable during your stay. The location is ideal, being located within walking distance from downtown and the Old Mill District. Right across the river, you will also find a park for kids, perfect for your little ones. During the winter, you are only 20 minutes away from skiing on Mt. Bachelor. What more could you ask for in such a beautiful location?